All your degrees are in engineering. How did you get into Lean management? Dilbert cartoons frequently present a stereotype of engineers as those who seek facts, logic, and good decision-making, and are therefore in perpetual conflict with managers who are not concerned with facts, logic, and good decision-making. That’s me; I seek facts, logic, and good decision-making. When I worked in industry, I saw crazy things happening and thought there had to be a better way. I just didn’t know what it was until I participated in kaizen in the summer of 1994. What Shingijutsu sensei taught me made so much sense. That’s was the beginning. You are a somewhat controversial figure. What’s up with that? Indeed. It’s because I say things that others will not say. It makes people uncomfortable, but it does get people to think and open up their minds. And that’s the point. I learned the importance of seeing reality from Shingijutsu sensei on day 1 of kaizen. The basic rule is that we cannot improve if we do not see reality. So I say things that simply reflect reality but which gets me in trouble every once in a while. But I think it is the right thing to do. You seem to be something of an outsider? That is true. I am not affiliated with any organization that promotes Lean. The strength of my work is that I have been free of any such conflicts of interest. This allows me to question things. If I were an insider, I would have to think like those on the inside, do things their way, and be forced to fall in line with Lean orthodoxy. The public benefits from someone like me who looks in from the outside. But the insiders don’t like it. What is your objective? What are you trying to accomplish? 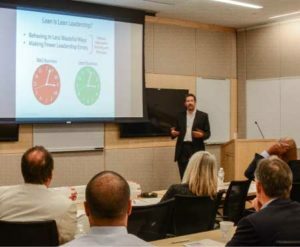 I am simply trying to help people better understand Lean leadership and Lean management, so that they can be more successful in their Lean efforts. I also want people to better understand Toyota-style kaizen, as that is what led Toyota to its production system and The Toyota Way. Organizations cannot learn to think like Toyota if they do not practice kaizen. Kaizen really is the key, yet it has been largely missing from Lean for nearly 30 years. You write a lot. Why do you write so much? It’s not to get rich. I write to think and learn, and then share my thinking and what I have learned with others so that they can hopefully benefit from it. There is more altruism in my work than most people imagine. That comes with being a professor. I get my ideas by listening to people and reading what others write, to learn what they do not understand about Lean. And I read a lot of diverse things and I think a lot about what I read for the purpose of identifying interesting associations and ways of presenting or explaining things that will hopefully help people better understand different facets of Lean. Human suffering. Employees, suppliers, and others suffer under chaotic conventional management (batch-and-queue material and information processing). Some leaders are just beginning to realize the human costs. The human costs are profound, given the many ways in which chronically stressful work environments can harm employees’ (and managers’) mental and physical health over time. Employees, suppliers, and others suffer under Fake Lean as well, and that’s why I’ve been advocating Real Lean – inclusion of the “Respect for People” principle in Lean practice – for over 20 years. Business leaders should not cause harm to human health and well-being. Work should be fun and people should be set up to succeed and know for certain that they are making meaningful contributions every day. It truly pains me to see the suffering caused by conventional management and by misunderstandings of Lean that lead to layoffs, not sharing financial gains with employees, and so on. My vision is that employees leave work physically and mentally healthier than when they arrived. What prevents leaders from adopting Real Lean? Classical and neo-classical economics seems to be the biggest of several different types of barriers that make it difficult for leaders to understand and practice Lean correctly (read my blog post, “How Economics Disrespects People”). I appreciate the motivation of reducing human suffering. When I started my career at GM in 1995, it was really sad to see how much the front-line workers (hourly employees and engineers) suffered under the traditional GM management system. I’m passionate about improving patient safety with Lean, but a core motivation is reducing human suffering amongst healthcare professionals… only then can they fully engage in reducing harm to patients. As was the case at GM, we have to change the management system and the culture. Yes, those on the front lines suffer the most. Yet mangers also suffer, though they do not always realize it. Hierarchies insulate those at the top and expose those at the bottom. I’m sure we agree, leaders must have far more concern for those at the bottom, be they physicians, machine operators, or office workers. Glad to see your reason for motivation; human suffering. Over my years of practicing Lean I’ve learned that Lean = Good Stewardship and to be a good steward is to care about all the people (and things) you are responsible for. Thanks Bob for keeping us on the correct tack.